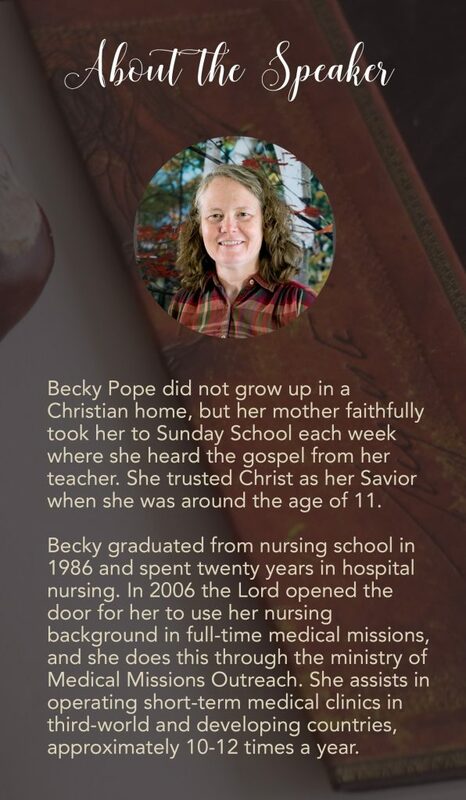 SHC believes that children are a gift from God. We love to minister to them during Teen, Junior, and Family Camps. 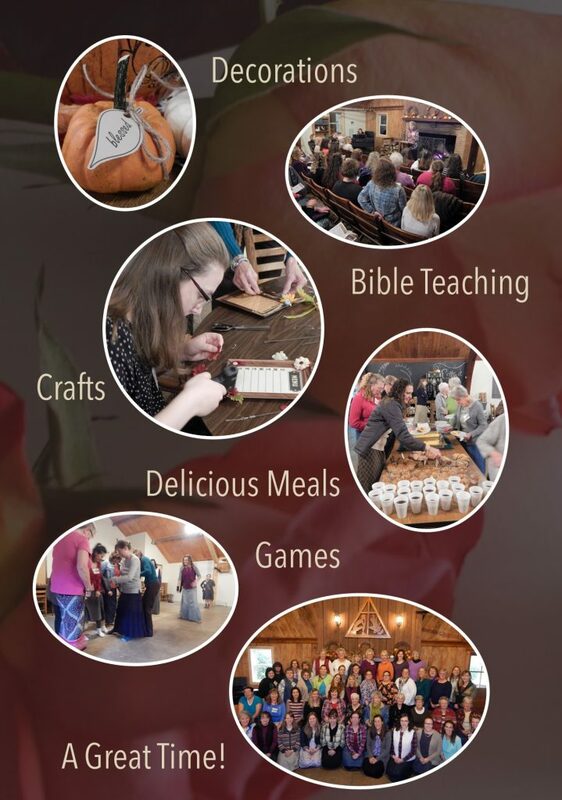 However, we ask that you do not bring your children to this retreat, but come and enjoy the fellowship of other ladies. Registration is at the in Hemlock Hall at Camp Susque on Thursday, October 24 from 6:15-7:15 pm, and the retreat concludes on Saturday, October 26 at 4:00 pm. Retreat includes a snack on Thursday evening, 3 meals and a snack on Friday, and a brunch and afternoon meal on Saturday. 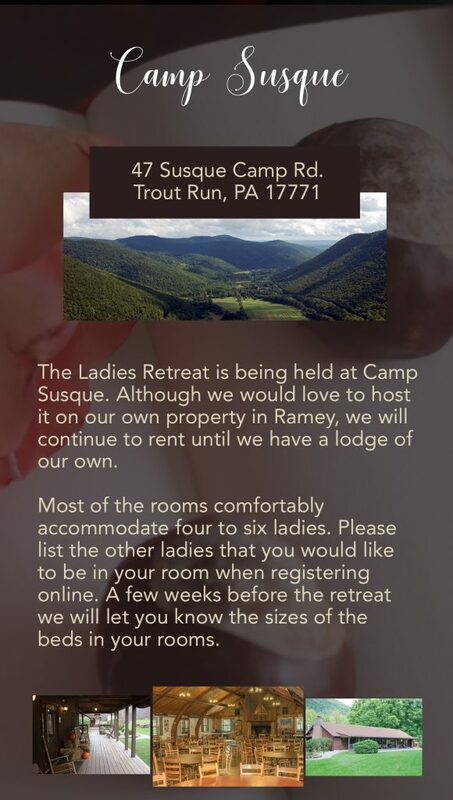 Lodging: Most of the rooms will comfortably accommodate 4 -6 ladies. If you would like to room with more than four other ladies, you may sleep with two in a bed or use a trundle bed stored under the double bed. A few weeks before camp, we plan to contact each group and let you know the sizes of the beds in your room. On your registration form, please list the other ladies that would like to be in your room. What to bring: Bible, pen, sleeping bag or appropriate bedding, pillow, towel, washcloth, personal items, clothes for outdoor activities. Note: If you have not made arrangements with a bunk mate, please bring a sleeping bag and not sheets. Dress: In order to maintain modesty and consistency, we ask that you abide by the following standards while at the retreat: All skirts or culottes/split skirts must cover the knee. Although loose fitting slacks may be worn for activities during the day, we ask each lady to wear a skirt for the evening rally. Please do not wear any low or tight tops. * All attire should represent a clear Christian testimony. Lost & Found: Lost items not requested within one week after camp will be appropriately donated or discarded. The cost for the weekend is $105. Click HERE for more pictures of Camp Susque. but until we have a lodge of our own, we will need to continue renting a facility. 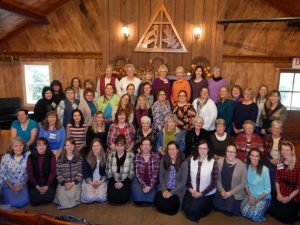 Click on this picture for more pictures of the 2018 ladies retreat.